Image: Marvel Comics. Art by Mark Bagley, John Dell, and Jason Keith. Ben Reilly has had a hell of a rough life. First, there was the whole business where he eventually learned he was a clone of Peter Parker (and then died saving him). Then he got resurrected years later, horrifically tortured, and turned to supervillainy. 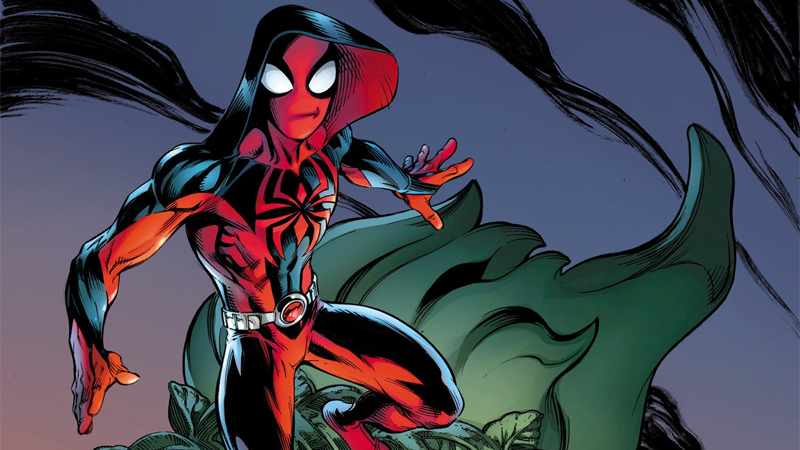 Now, he’s back in action as the Scarlet Spider... but he’s not quite all right. This week new Scarlet Spider series—by Peter David, Mark Bagley, John Dell, Jason Keith and Joe Caramagna—picks up in the wake of Ben’s decision to try and become himself again at the end of Clone Conspiracy. At first, it’s easy enough to think that Ben’s moving on from the pain and suffering he endured at the hands of the Jackal—a new costume, a return to his heroic identity, and a new start in the glimmering lights of Las Vegas. But it’s right around the time that he admits his creepy new costume was stolen from a cosplayer he left naked in a hotel restroom after their encounter that you start to realize that not everything is okay with Mr. Reilly. The bit where he has a conversation with an imaginary version of his old Scarlet Spider self immediately after is the next clue. Admittedly, when this comic was first announced, I was skeptical that it would really be doing anything new with Ben. It looked yet another Spider-book that’s just going to be a Spider-Man book with a different lead character. But Scarlet Spider builds on the anguish and torture Ben suffered throughout Clone Conspiracy—where Miles Warren murdered, revived, and murdered him over and over again in a hellish experiment Ben had no choice but to remember and live through—to show that Ben Reilly has become a changed man. A man plagued with maddening visions of his past selves, bouts of rage, and a bitter drive to prove that he’s moved on from being stuck in Peter Parker’s shadow, even if it becomes very much clear later on in the issue that he hasn’t. The new Ben is a volatile, unpredictable character. He’s swinging around Vegas acting like he’s a hero—but the uncompromising, uncaring streak he developed during his time acting as the Jackal still comes through in some pretty disconcerting manners, as we see in his first encounter with a mugger while on patrol. The scenario is classic Spider-Man material, but Ben’s damaged psyche—and his lingering resentment at being in Peter’s shadow—makes his mood easily tilted... even the barest mention of Peter Parker or Spider-Man is enough to set him off. But for all the anger and the bravado Ben professes while out being a “hero,” so far it seems like being the Scarlet Spider is a (literal and metaphorical) mask for someone who still can’t quite let go of his story of living Peter Parker’s life. Early on, Ben mentions how lonely he feels in Las Vegas, but later on in the comic we see his loneliness intermingle with his turmoil over Peter in some distinctly disturbing ways. He prowls the floor of a casino later on in the issue, only to find an elderly gambling addict at a slot machine arguing with her husband... only to latch on to her as his own “Aunt May,” standing by her and fending her husband off, despite the fact the woman is entirely oblivious to his presence. Because if Peter Parker has his own Aunt May, shouldn’t Ben Reilly have one? It’s unsettling to watch unfold, and yet weirdly fascinating. The internal struggles being set up here—is Ben a hero or is he a villain? Is he truly on his own or is he still linked to Peter Parker in some unknown way?—are so far making for a far more compelling take on the character than any “normal” Scarlet Spider book could have. It’s rare to see an event series have this sort of a lasting impact on a character, and see it handled so interestingly. This “new” Ben Reilly is someone who has lost everything, again and again, and struggling to find his way in the world after a deeply traumatic experience. I can’t wait to see where his story goes next.